. . . or we’d miss the one pizza outlet we can rely on for consistently good bases, tasty sauces and the best topping combinations. I’m very fond of pizza. I can now break down what a good pizza is to me – the perfect base (not too thin, not too thick and leathery), a really well flavoured sauce that’s not overcooked, a combination of mozzarella and a sharper cheese. I rarely feel the need to add any toppings, because if you have these basic three components done well, you’re golden. The first time I went to Jamie’s was in its opening week. I was disappointed, and had to be dragged back the second time by Deval who wanted an espresso and snack before a movie. Somehow the white rocket pizza caught my eye, and I ordered it. IT WAS DIVINE. 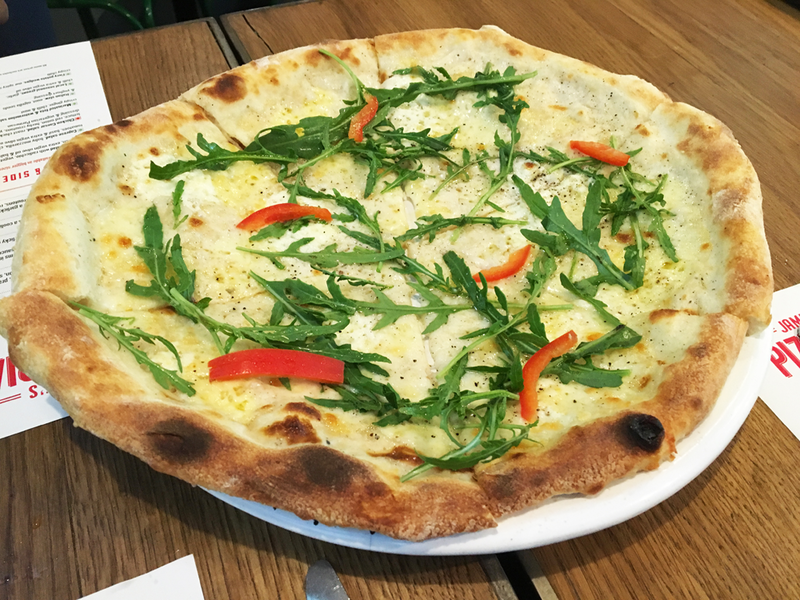 It has a great base, no tomato sauce but the perfect combination of mature cheddar, parmesan and mozzarella topped with rocket leaves and a drizzle of olive oil, lime and jalapeño. After that second visit, Jamie’s has been consistently great. I have taken people only to eat this particular pizza, and they have blessed me. 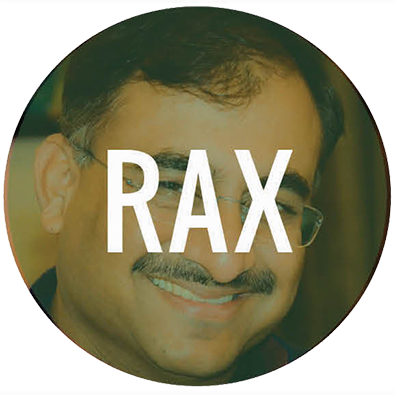 That’s how Rax and I ended up here this time. 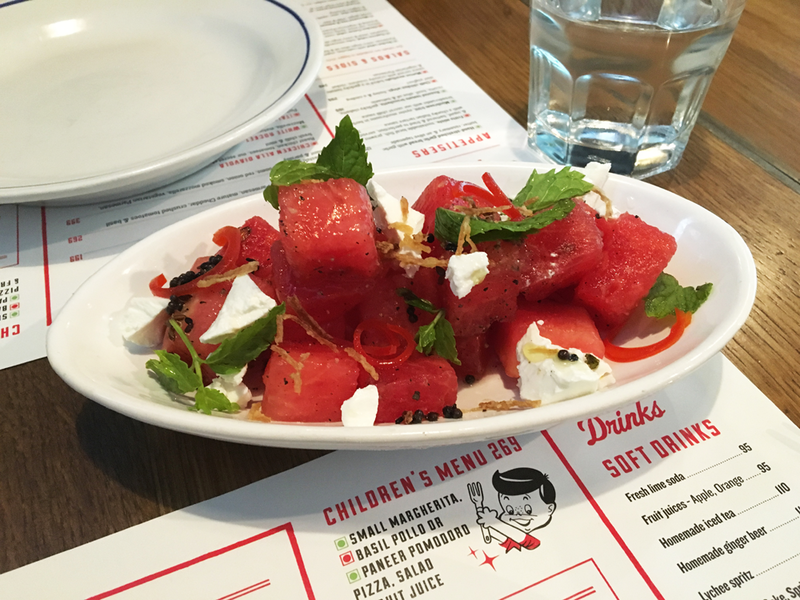 The watermelon and feta salad was topped with ginger, so good. The white rocket pizza, delicious as always. 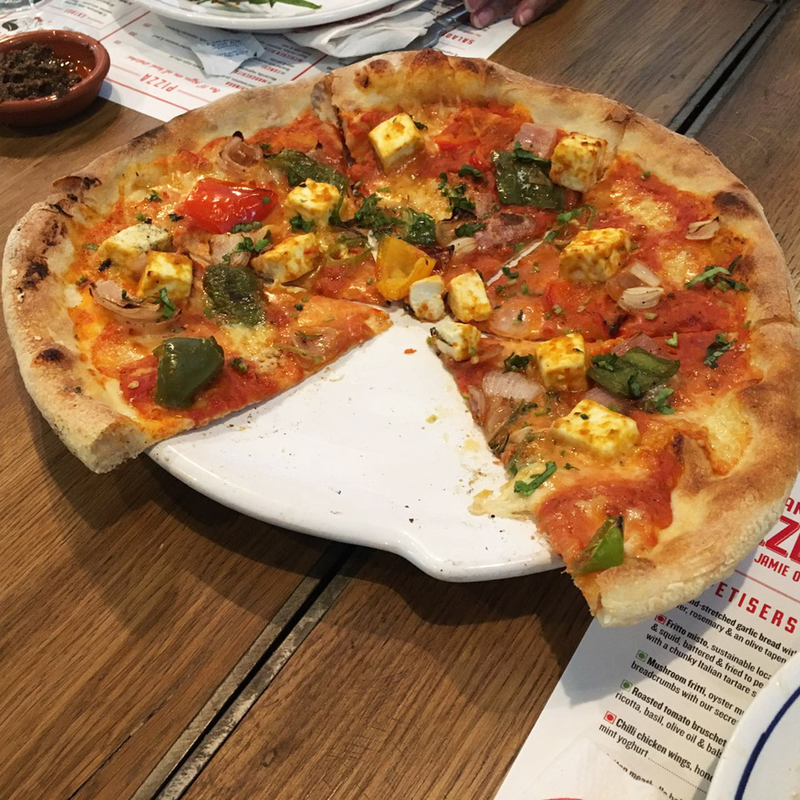 The paneer picante, not to my taste but I think many people who like spicier flavours will enjoy it. 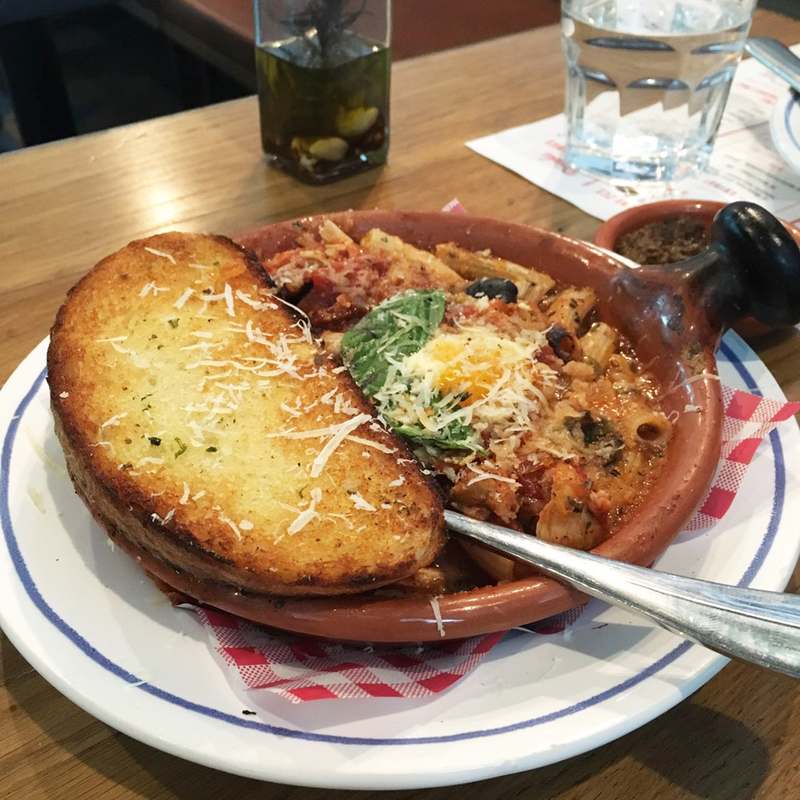 The pasta puttanesca with chicken was reportedly very tasty as well. Definitely worth a visit if you haven’t been, and completely different/far superior to Jamie’s Italian in Vasant Kunj. This visit to Jamie’s Pizzeria was with hesitation. 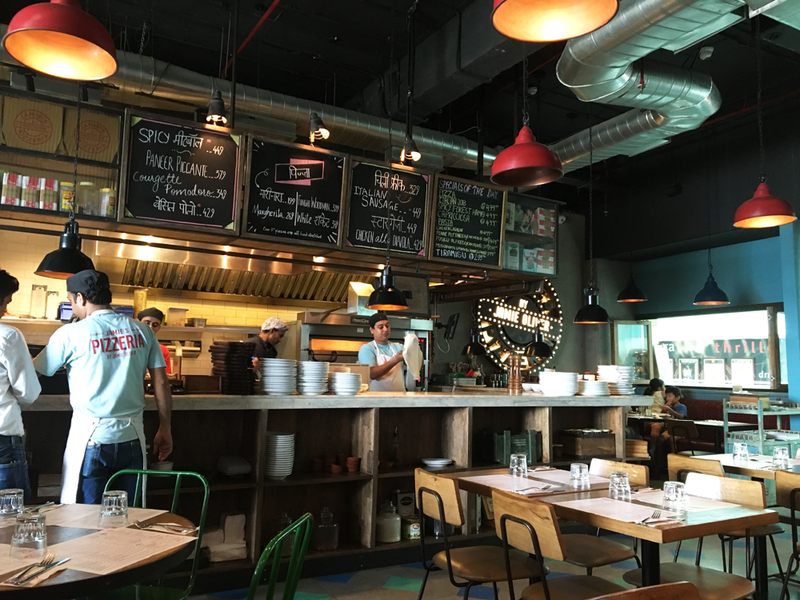 Jamie’s Italian, Vasant Kunj, was terrible but I was told that this was different and I must try it. 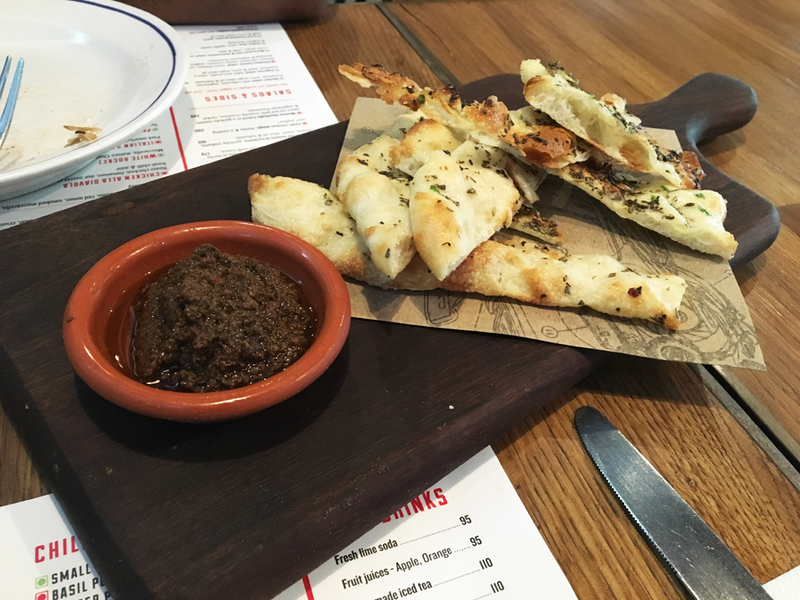 We started with an order of the Garlic Bread, which was pizza dough cut into strips and baked. Quite good. I was recommended the Paneer Piccante and my sister went for the White Rocket. Somehow, pizzas without tomato based sauce don’t seem like pizza to me. Nevertheless, it was flavourful. I really liked the base of my pizza, thin yet crusty, not limp and doughy like most places. The sauce was balanced but I didn’t care much for the paneer on it. Probably an effort at Indianization but frankly they can do without all that. Excellent pizzas, probably one of the better ones on town.